Since 1965, the Electra Glide® model has been the choice of riders who want the essential touring machine. One ride and you’ll know why. Standard Features Milwaukee-Eight™ V-Twin Engine A powerful, smooth-running engine with crisp throttle response and a pure, soul-satisfying rumble. Responsive Suspension High-performing front and rear suspension with easily hand-adjustable rear shocks put you in control of a plush ride. Reflex™ Linked Brembo® Brakes with Standard ABS The front and rear brakes are electronically linked to provide exactly the right amount of brake to each tire no matter the road condition. No matter how good you are, this will make you a better rider. Daymaker™ LED Headlamp and LED Fog Lamps Confidently roll through the night with 2,136 powerful, daylight-simulating lumens that bathe the dark road in natural light, a shoulder-to-shoulder spread of 160 feet and 450-foot punch. 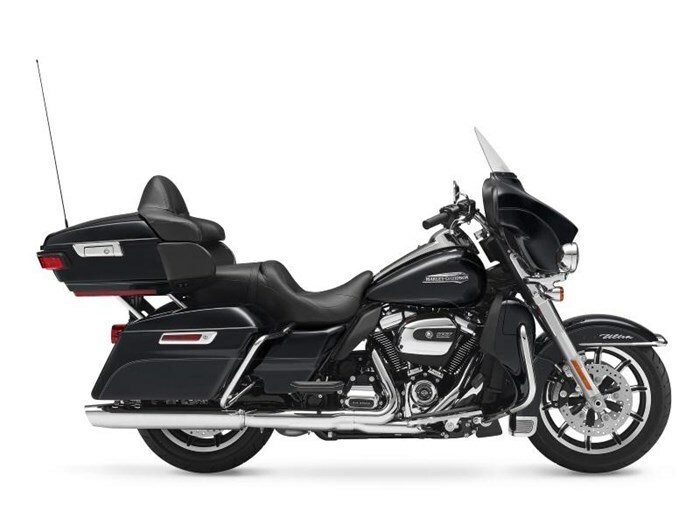 Supreme Comfort for Two-Up Riding The longer the ride, the more you’ll appreciate the comforts of this machine including the two-up Electra Glide® seat with a deep bucket and a narrow neck to provide rider back support, and a wide passenger area with back and armrests. BOOM!™ Box 4.3 Infotainment System Powerful and balanced sound for you tunes along with entertainment and communication at your fingertips. Includes Bluetooth® capabilities and a USB port.